The adoption of current Medicare reimbursement rates across the board would reduce New York hospital revenues by 17% statewide, cutting income for 77% of the state’s hospitals. Total revenues would be cut by more than a quarter at 19% of the state’s hospitals. Even if Medicare reimbursement rates were increased to maintain aggregate statewide hospital spending, revenues would still be altered, up or down, by more than 15% at about half of the state’s hospitals. For many hospitals, the revenue cuts under either scenario would be deep enough to compromise their quality of care, trigger layoffs, and put them at risk of closure. Hospitals serving affluent downstate communities would face the biggest cuts in access to care. The New York Health Act (NYHA) is a bill that would have the state purchase comprehensive medical services for all residents, the costs to be borne by taxation. It currently has broad support in the state legislature. Proponents of the legislation, essentially a single-payer health-care plan, hope that higher-income New Yorkers would fund expansions of benefits for those lower down the income scale. There are various projections of the legislation’s overall cost, but far less attention is being given to the likely impact on hospital revenues resulting from the legislation’s displacement of private insurance by a government fee schedule. Many hospitals that currently receive relatively high reimbursement rates from privately insured patients could see a significant drop in their revenues. The analysis of hospital revenues presented here is based on a reasonable assumption that, under NYHA, all health-care services would be paid by the state using a Medicare-like reimbursement system. This paper therefore compares payments to each New York hospital made by Medicare and other payers, including private insurance, to determine the likely financial impact of a switch from a multi-payer system that includes a portion of market-based fees to a single-payer system in which all fees are publicly regulated. In sum: the adoption of current Medicare reimbursement rates across the board would reduce New York hospital revenues by 17% statewide, cutting income at 77% of the state’s facilities. Total revenues would be cut by more than a quarter at 19% of the state’s hospitals. Even if Medicare reimbursement rates were increased to maintain statewide aggregate hospital spending, revenues would still be altered, up or down, by more than 15% at about half of the state’s facilities. A shift to Medicare fees under either scenario would tend to redistribute funds from larger to smaller hospitals, from urban to rural areas, and from lower-poverty to higher-poverty counties. For many hospitals, the cuts would be deep enough to compromise the quality of care, trigger layoffs, and put the facilities at risk of closure. Hospitals serving affluent downstate communities would likely face the biggest cuts in access to care. Under NYHA, the state would pay for the health care of all residents currently enrolled in Medicaid, Medicare, employer-sponsored insurance, Child Health Plus, the state’s Essential Plan, and the individual market. It would also expand coverage to the 6% of the state’s residents who are uninsured, regardless of immigration status.7 Coverage would include the essential health benefits required by ACA. It would also pay for dental and vision-care services that many existing insurance plans do not cover. It would use public funds to pay for all costs that are currently borne by insurers or out-of-pocket by individuals—in other words, no deductibles or copays—with the exception of long-term care, over-the-counter drugs, and elective cosmetic surgeries.8 Providers would be prohibited from charging anything in addition to administratively established rates that the state determines are “reasonable and reasonably related to the cost of efficiently providing the health care service and assuring an adequate and accessible supply of the health care service.”9 Selling private insurance would become effectively impossible. Medical services would be funded through a combination of payroll and non-payroll taxes, but the bill leaves specific brackets, rates, and exemptions to be determined later. NYHA would require federal waivers under the Social Security Act to restructure federal funding currently distributed to New Yorkers under Medicare, Medicaid, and the ACA exchange. The current CMS administrator, Seema Verma, has stated that she would deny any such waivers requested by states seeking to establish single-payer health-care arrangements.10 The state’s single-payer plan could also be preempted from interfering with the health benefits of self-insured employers under the federal Employee Retirement Income Security Act (ERISA), or from restricting competition among privately administered plans under Medicare Advantage and Medicare Part D.
Although NYHA is vague in describing the specific payment arrangements that its advocates claim would generate major savings to state health-care spending, it would nonetheless be fair to assume that payments to hospitals would be based on Medicare rates. This is not just because single-payer reforms are often advertised as “Medicare for All.” Rather, the basis for the assumption is that Medicare rates have been calibrated over time for the purpose of maintaining acceptable levels of access to a comprehensive range of care services in different areas—and any other arrangement would likely be an invitation to a lobbying free-for-all and chaotic special pleading by every provider. Currently, hospital revenues consist of reimbursement rates that vary considerably from one payer to another, with Medicare and Medicaid typically paying much less than private insurers. Private insurers’ payments also vary from hospital to hospital, depending on individually negotiated contracts. A hospital’s revenues, in short, currently depend on what mix of payers covers its patients, and how much market leverage the hospital has in negotiating with private insurers. Hospitals that treat a larger share of privately insured patients, as well as those in the least competitive markets, command relatively high reimbursement. Hospitals that treat a larger share of Medicare and Medicaid patients, or operate in more competitive markets, receive relatively low reimbursement. Spending-neutral Medicare rates—Medicare rates proportionately increased to keep aggregate statewide hospital revenues at current levels. To be sure, another likely feature of any single-payer reform would be amendments tailored to secure the support of legislators by shielding their local medical providers from financial harm. The 2010 Affordable Care Act was replete with provisions, such as those colloquially known as the Louisiana Purchase, Cornhusker Kickback, or Bay State Boondoggle. No accurate estimate of the likely cost of NYHA is possible without gauging the costs involved in such provisions. Even so, estimating the effects of single-payer revenues to the state’s hospitals gives one a sense of what politicians would feel pressured to offset. Estimating NYHA’s effect on state hospital revenues begins with the “Hospital Cost Report Audited Data: 2015” from the New York State Department of Health.16 The primary source is Exhibit 46, which itemizes “gross charges” and “allowances” (or discounts) for each hospital in 14 payer categories: Medicare, Medicaid, nonprofit indemnity, commercial indemnity, HMO Medicare, HMO/PPS Medicaid, HMO other, self-insured, workers’ compensation, no fault, uninsured/self-pay, government, charity, and other special arrangements. Exhibit 46 also lists Medicaid supplemental payments (including Disproportionate Share Hospital, or DSH, payments), bad debts in multiple categories, hospital surcharges (various taxes on hospital revenues), and net patient service revenue.17 Fourteen of the state’s facilities were omitted from the analysis because of their status as non-general hospitals (i.e., they specialized in psychiatric care or long-term rehabilitation) or atypical financing. For each hospital, “gross charges” and “allowances” were grouped into four categories: Medicare combined, Medicaid combined, private insurance, and “other” (workers’ compensation, no fault, uninsured/self-pay, government, charity, and courtesy). In each of those four categories, net revenue was calculated by subtracting allowances and bad debt from surcharges. DSH and other supplemental payments were added to net revenue for Medicaid. In each category, net revenue was divided into gross charges to generate a “discount rate” for each hospital. The combined amounts for all hospitals in each category were also used to find statewide discount rates. In the aggregate, the state’s hospitals collectively received 35% of gross charges. The variation between payers can then be used to compare payments between them. In the aggregate, Medicare paid 28% of gross charges, Medicaid (including DSH) 36%, private insurers 46%, and “other payers” 16%. Increasing the Medicare discount proportion by 20.5%—on average from 28% to 34%—and applying it to all charges for each hospital, to establish spending-neutral Medicare reimbursement rates. 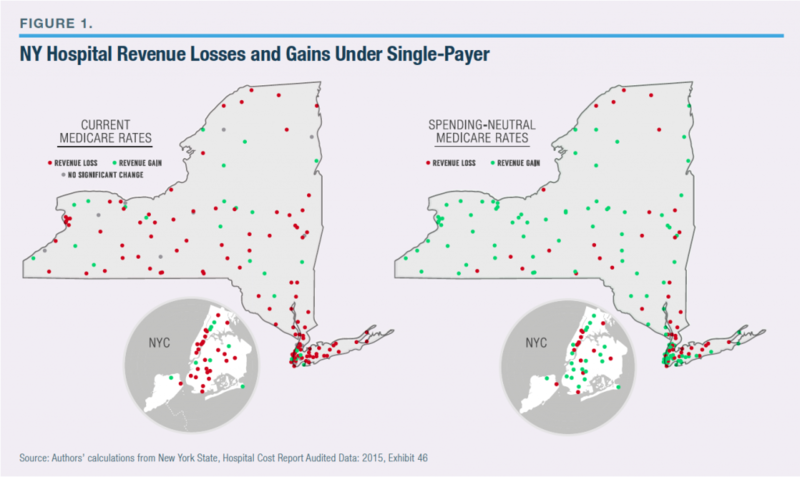 These calculations allow us to determine the extent to which hospitals would lose by switching from privately insured to current Medicare or adjusted Medicare rates, relative to what they would gain from payers whose rates are currently set below these levels (Figure 1 maps the winners and losers). If all hospital fees were fixed at Medicare rates, annual statewide hospital spending (based on 2015 data) would fall by $10 billion, or 17% (see Appendix). Seventy-seven percent of facilities would see decreased revenues, and 23% would gain. Although hospitals would likely respond to reductions in revenue by cutting costs, 40% of the state’s hospitals would, under this scenario, face revenue shortfalls greater than 15%, and 19% would lose over a quarter of their revenues—leaving many facilities at serious risk of closure. If Medicare rates were adjusted to be spending-neutral— keeping aggregate statewide hospital expenditures at their preexisting level ($61 billion in 2015)—111 hospitals would see increased revenues, including 66 hospitals where the gain would exceed 15%. Another 65 hospitals would see decreased revenues, including 22 where the loss would exceed 15%. Either way, some of the biggest losers from a shift to Medicare rates would be in New York City. Even with no change in overall hospital spending, Queens Hospital Center would see a cut of 45% (or $228 million) in revenues, the Hospital for Special Surgery would see revenues decline by 35% ($284 million), and both Kings County Hospital Center and NYU Langone would face 32% cuts ($339 million and $537 million, respectively). 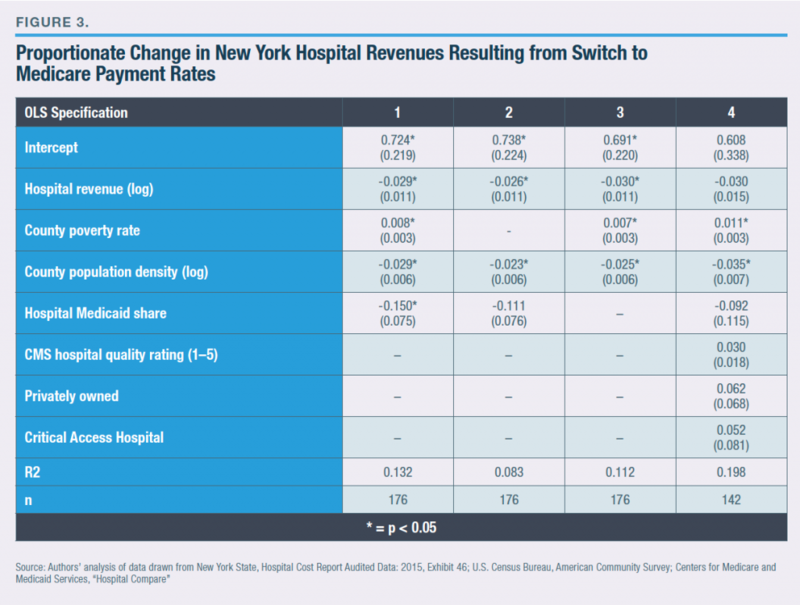 The biggest winners from a spending-neutral shift to Medicare rates would also include New York City hospitals. Lincoln Medical Center and St. Barnabas Hospital in the Bronx would see increases in revenue of 48% (or $252 million) and 42% ($140 million), respectively. Small rural hospitals in the state’s North Country, such as Clifton-Fine Hospital in Star Lake and River Hospital in Alexandria Bay, would also see increases in revenues above 40% ($4 million and $7 million, respectively). The impact of shifting hospital payment from the current mix of public and private health-insurance reimbursement rates to a single Medicare-based schedule of fees is significantly correlated with various features of the facilities and the communities they serve. Holding hospitals harmless from the switch to spending-neutral Medicare rates would add an additional 6.4% (or $3.9 billion) to current New York hospital spending. Increasing spending to prevent any cuts in hospital revenues greater than 5% would raise the state’s total hospital spending by 4.3% (or $2.6 billion). The estimates by RAND provide a useful survey of the likely statewide consequences of the reforms proposed by NYHA. However, they do not attempt to capture the on-the-ground impact that such sweeping changes would likely impose on individual providers and communities. Replacing the array of private and public hospital revenue streams with Medicare reimbursement rates would reduce hospital revenues statewide by 17%—from $61 billion to $51 billion. If Medicare rates were adjusted upward so that there would be no difference with the current level of aggregate hospital spending, the majority of hospitals would still experience revenue change—either up or down—by more than 15%. The radical impact that a single-payer system would have on provider revenues is hard to avoid, and the long-term implications are likely to be significant and complex. Hospitals would be reimbursed for currently uninsured and charity-care patients at the standard rate—which should substantially increase revenues for hospitals providing a lot of uncompensated care. Currently wealthy hospitals with a mix of revenue streams including employer-sponsored insurance would find themselves with less money to spend on personnel, equipment, and facilities, while currently low-funded hospitals would have more to spend. Individual physicians would see less opportunity to increase their income through professional achievement. The highest-paid ones might choose to leave the state, potentially diminishing the overall quality of care available in New York. At the same time, physicians serving lower-income communities would pay less of an economic penalty for doing so. Poorer communities would undoubtedly welcome an infusion of resources for their local hospitals and other providers. Higher-income residents—who might be willing to pay higher taxes for expanded medical services to lower-income residents—might be far more reluctant to accept cuts in quality and access to care at their local hospitals. Thus a single-payer plan—in addition to its dramatic effects on medical-services levels and tax rates—would have profound financial implications for the hospitals, doctors, and other providers that manage the health care of 20 million New Yorkers and account for nearly one-fifth of the economy. Even if overall spending levels were held constant, single-payer health care would dramatically redistribute funds among institutional and individual health-care providers, significantly increasing revenue for some and significantly reducing it for others. Some hospitals would likely face losses severe enough to diminish quality of care, trigger layoffs, and threaten closure. Click here to view Appendix (PDF, page 12). 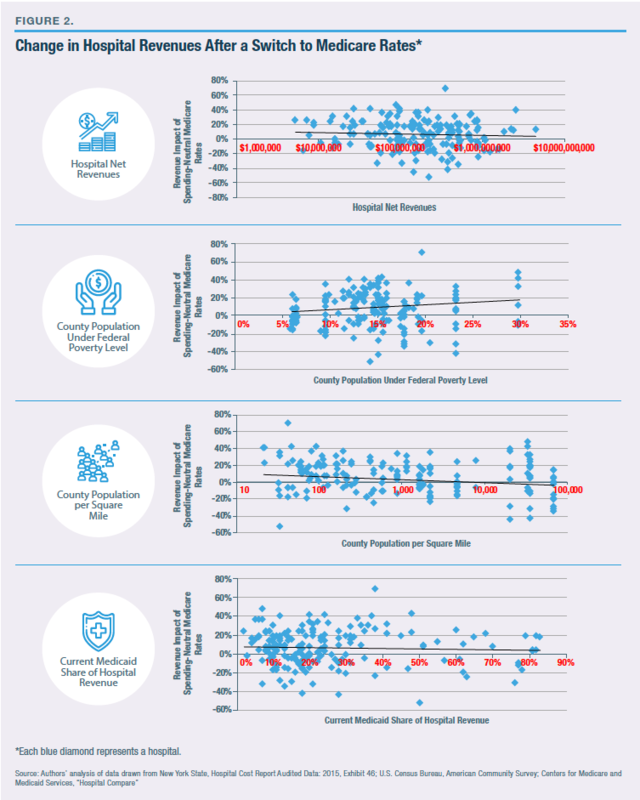 1 KFF (Henry J. Kaiser Family Foundation), Marketplace Average Benchmark Premium, 2014–18; idem, Health Care Expenditures per Capita by State of Residence, 2014. 2 U.S. Census Bureau, “Health Insurance Coverage in the United States: 2017,” Table 6: Percentage of People Without Health Insurance Coverage by State: 2013, 2016, and 2017. 3 State of New York, New York Health Act, A.4738/S.4840. 4 Karen DeWitt, “Single-Payer Health Care an Issue in New York Governor’s Race,” WSKG.org, Aug. 30, 2018. 5 Bill Hammond, “Single-Payer Fact Check,” Empire Center for Public Policy, Aug. 31, 2018. 6 Robert Harding, “Molinaro Pledges to Veto Universal Health Care Bill if Elected NY Governor,” auburnpub.com, July 26, 2018. 7 Census Bureau, “Health Insurance Coverage in the United States: 2017,” Table 6. 8 NYHA requires the state to develop a plan for adding long-term care coverage within two years of passage. 9 Section 5105, subsection 4. 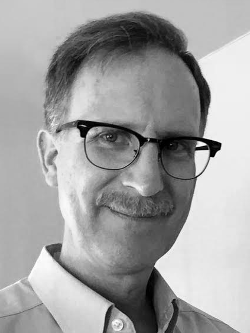 10 Virgil Dickson, “Verma Will Reject Any Single-Payer State Waivers,” Modern Healthcare, July 25, 2018. 11 Gerald Friedman, “Economic Analysis of the New York Health Act,” April 2015. 12 Avik Roy, “The Price of Single Payer,” Foundation for Research on Equal Opportunity, March 2017. 13 Jodi L. Liu et al., “An Assessment of the New York Health Act: A Single-Payer Option for New York State,” RAND.org, 2018. The report acknowledged that their projections do not fully account for dynamic effects on business, labor supply, or other tax-avoidance activities by those remaining in the state. RAND estimated that eliminating cost-sharing, preferred-provider networks, claims review, and gatekeeping of access to specialty services would help reduce medical administrative costs from $82 billion to $59 billion in 2031, but would not have any impact on the level of fraud and abuse. 14 See New York Income Tax Calculator (smartasset.com): 37% federal + 8.82% state + 3.88% local. 15 Liu et al., “An Assessment of the New York Health Act,” p. 30. 17 A DSH serves a large number of Medicaid and uninsured patients; see “Medicaid Disproportionate Share Hospital (DSH) Payments,” Medicaid.gov. 18 MACPAC (Medicaid and CHIP Payment and Access Commission), “Hospital Payment: A Comparison Across States and to Medicare,” April 2017. 19 Much unexplained variance remains after controlling for each of these factors. This may be partly due to omitted variables (such as differences in patient mix or the degree of market power currently enjoyed by each hospital) or imperfection in model specification, but it also suggests a large random component to the changes in revenues associated with the switch to Medicare rates. To the extent that this is the case, cuts may be felt as an arbitrary imposition, and increases in payments may fail to advance specific public goods.